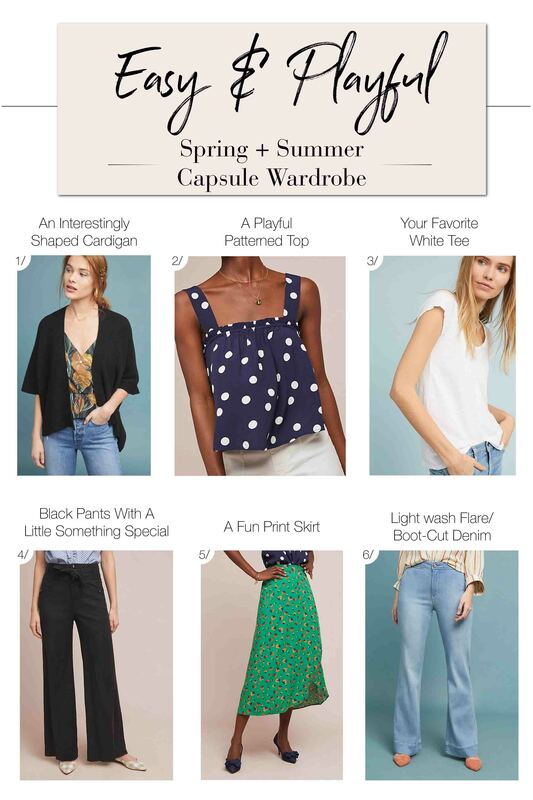 Ahhhhh…the capsule wardrobe. What a brilliant idea, right? Identify items you love, and wear them over and over again in various combinations. If my 5-year-old was to make a capsule wardrobe, it would definitely involve his hand-me-down (from Pax) tuxedo pants. He would happily wear them to school, to every birthday party, to the Parkour gym, to swimming lessons, and definitely to bed as well. I mean…these tuxedo pants are PRETTY amazing. Why NOT wear them to everything? I’ve decided I need to focus on wearing the things I love, too. I often get stuck (especially in winter) wearing my Black Sweater And Straight Leg Gray Jeans Uniform. Black and gray is easy, and..sometimes easy feels good. Bolder color and patterns, though, bring me joy. Color and pattern are totally MY tuxedo pants. 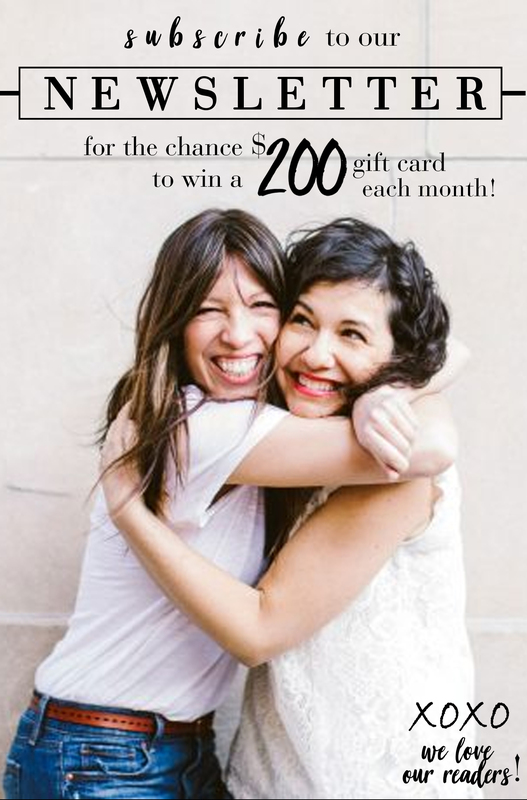 When I look in my closet at the pieces that bring me joy, many of them come from Boden and Anthropologie. Both places do pattern and color (plus basics with a little bit of interest) very well. 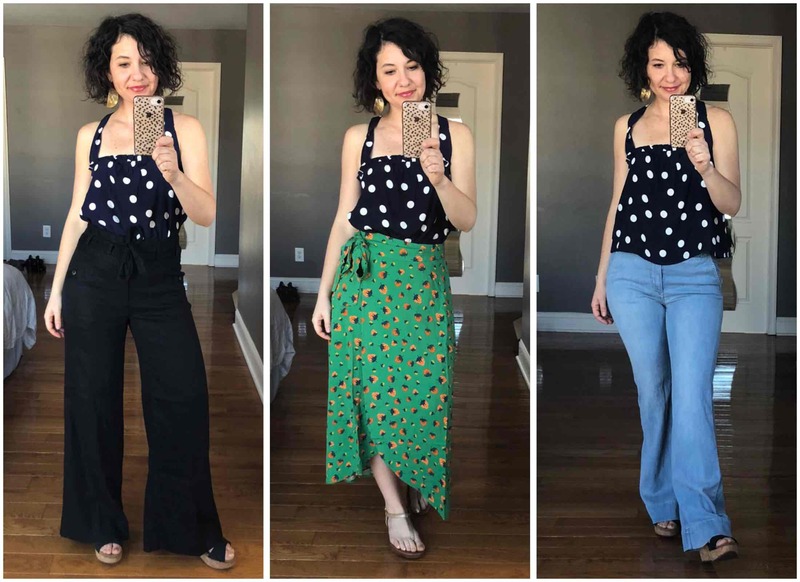 I am in LOVE with so many pieces at Anthro right now, so I wanted to see if I could mix and match two of their bolder patterned pieces with four of my fav Anthro go-to basics (that have something a little interesting going on) to make a mini spring-summer capsule wardrobe. Number 2: Let me know what else you guys think my capsule needs. I adore this polka dot top. SO fun to wear! If you click through, you’ll see that it has adorable, adjustable criss-cross buttoned straps in the back. Nice to be able to play with the length. The skirt pulls on and has an elastic waist — not a true wrap skirt (which is much easier for me to wear) — size down if you’re in between. I went with a smaller size because my regular size didn’t hang quite right from the waist. The jeans need to be hemmed a bit more, but I’m happy with the rest of the fit. I was worried they would get super stretched out after wearing, but so far the stretch has been just right. The tie-waist pants do stretch a bit, so I would size down if you’re in between. They can be cinched tighter or looser, though, with the tie waist, which is always a nice feature. This is my new favorite white tee. Super soft, perfect length sleeve, and thin enough to easily tuck in to skirts (without getting bunchy), but not as see-through as many of the super-thin tops out there. I also like that it’s a low scoop neck, but doesn’t droop too low down and show my bra (I am not a “top-of-my- bra-peeking-out” person). The skirt pulls on and has an elastic waist — not a true wrap skirt — size down if you’re in between. I went with a smaller size so it would hang right from the waist. The jeans need to be hemmed a bit more, but I’m happy with the rest of the fit. So far the stretch has been just right. The tie-waist pants stretch a bit, so size down if you’re in between. They can be cinched tighter or looser, with the tie waist. I’m not usually super into the kimono look, but this one hits that sweet spot between a kimono and a cardigan. A different enough shape to not read as “totally boring cardigan”, but still easy to throw over everything. It’s soft and a really nice weight for spring. I have to say…I think it looks better in person. It has a bit of movement which makes it more interesting than these selfies show. Now go to that closet and find some JOY! Love this! 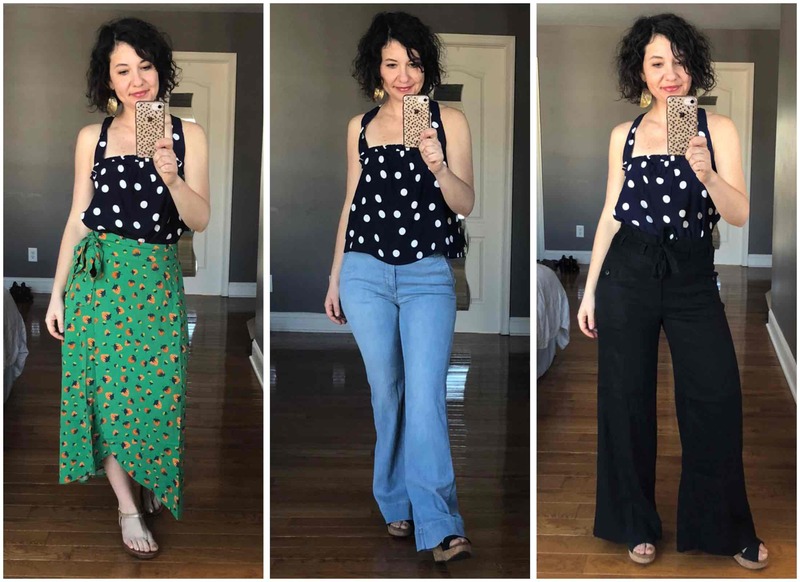 That polka dot top and those black pants are so so good! I am trying to think of what I have in my closet. 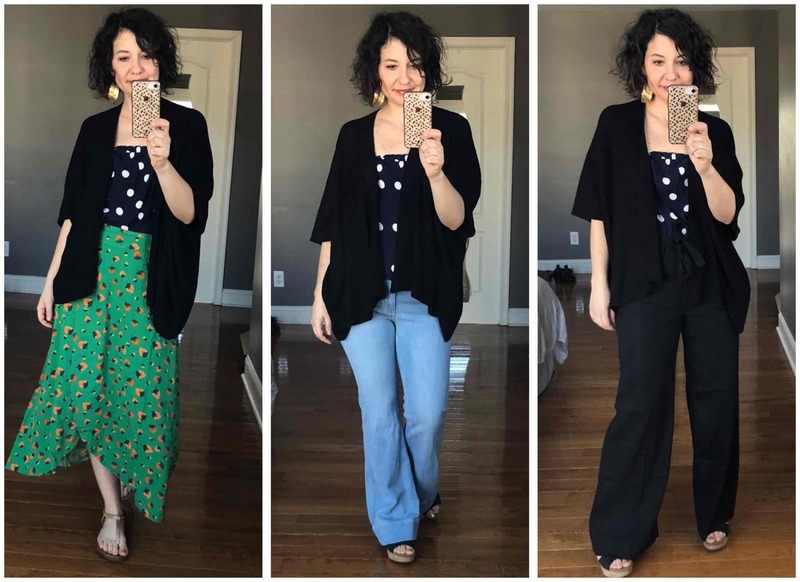 My go to black cardigan is knee length and I feel like that makes it very versatile. And my black pants are a cropped wide leg. Again, very versatile. I wear them all the time. All year round. I do love your pants here a lot, though! My wardrobe is sorely lacking in fun skirts. I need to work on that situation! And I think a good dress should be added to the capsule. This is fun! 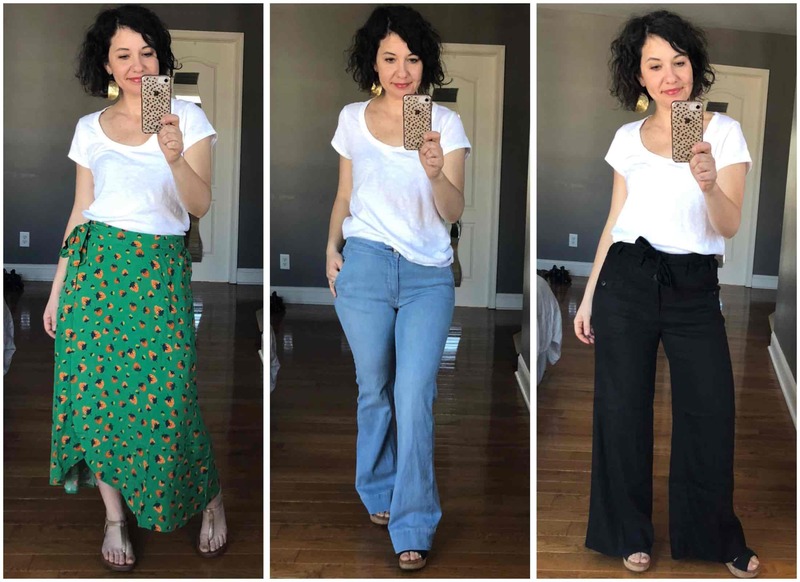 There are so many fun skirts out there right now for spring and summer…I used to feel like I could only wear a fun skirt every once in a while because people would remember that I had worn it recently, but now that I’m in my 40’s I’m COMPLETELY over that. Fun skirts are now worn on repeat and quite frequently. Good call on the dress! How fun! I love those black pants! For reference, how tall are you? I’m 5′ 5” and wondering if they’d be too long for flats . . .
I’m 5’2. I got the petite and didn’t need to hem them. 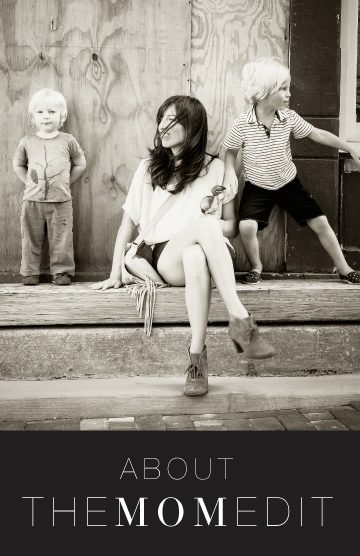 So…I’m guessing if you go with the petite as well, they would work for flats. They look like a pretty easy hem, though, if you have to go that route with the regular sizing. I just ordered this dress that I think would work really well in a capsule. It can be dressed up or done depending on shoes, is super comfortable and has pockets!!! I ordered the green because i like green with my hair color, but I really love the mustard color, too!